A before-and-after look at Zion Lutheran Church, Pittsfield, Mass. 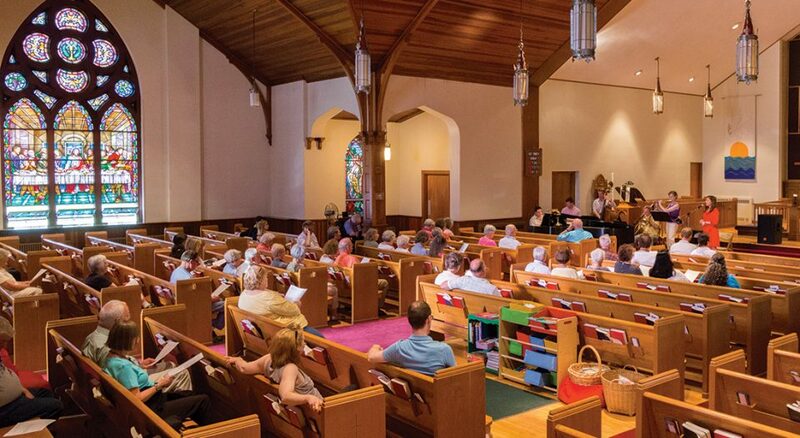 The Jazz Vespers service in May 2015 shows the sanctuary prior to the congregation’s renovations. 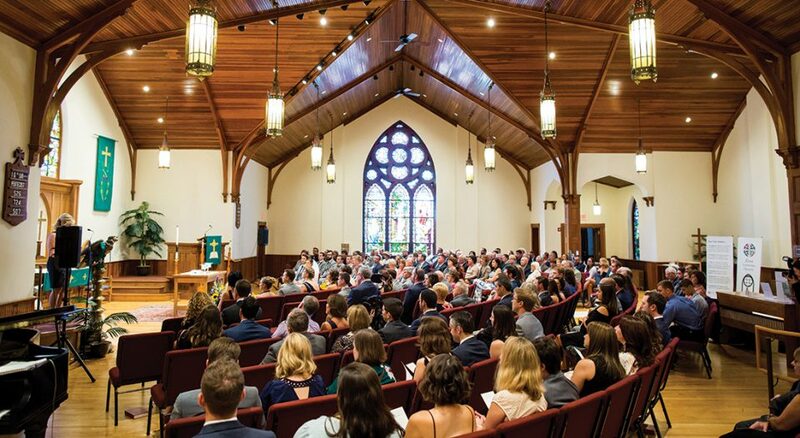 A wedding in the now-renovated Common Room, September 2017, in worship configuration. 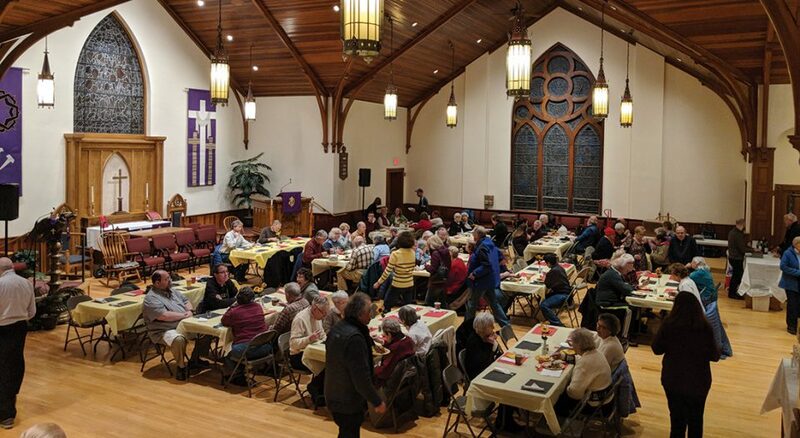 The congregation’s Taste of Germany dinner was held in the Common Room in March 2018. 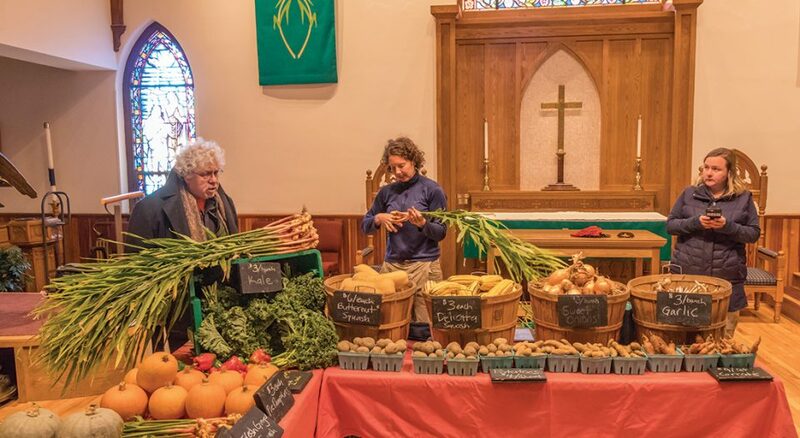 The monthly Downtown Pittsfield Winter Farmers Market was held in the Common Room in November 2017. The pulpit front and center. Sunlight streaming through stained glass. Pews stretching from wall to wall with hymnals and offering envelopes tucked in the back, awaiting parishioners on a Sunday morning. This is the traditional setup you expect to see when you walk into a church sanctuary. And it’s exactly what Zion Lutheran Church in Pittsfield, Mass., looked like—until a few years ago, when the congregation decided to set tradition on its ear. Faced with mounting deferred-maintenance costs, zoning concerns and the necessity of making the five-story, 26,000-square-foot building compliant with the Americans With Disabilities Act, Weisman and the congregation bade farewell to their 46 pews and created a space to be used not only for praise and prayers but for company and community. The latter is what Zion parishioners and the entire Pittsfield community now have: a place to gather for more than just a Sunday sermon. The sanctuary, now called the Common Room, has hosted public concerts, theater rehearsals and farmers markets. In the room’s first year of existence, Zion has hosted 149 public, nonsectarian events and nearly 8,000 people have walked through its doors. As for the sanctuary’s traditional use, Weisman said the congregation’s response has been mostly positive—but he admits he wasn’t sure that would be the case. After all, the vision was to replace pews with removable chairs. Almost nothing in the sanctuary would be nailed down. The plan went through years of thought and meetings before becoming reality. In the end, 95 percent of the congregation voted to approve funding for the $1.2 million plan, which included more than just the Common Room change. The congregation also added lighting and air conditioning, updated bathrooms, and fixed aging plaster and paint. Now it’s a matter of members getting used to the changes, even if this may take a little time. Weisman has seen the difference in the way his church is viewed by the congregation and community alike. He has taken calls from other pastors to talk through the changes—everything from “sanctuary chairs to capital campaigns,” he said. Some people come to Zion just because they want to see the new space, he added. Former members who have moved away from Pittsfield are reconnecting with the church. Zion is getting more attention and recognition on social media. And it all started with a call for change, a plan and a prayer. Jay Saunders has more than 20 years' experience writing for television, newspapers and magazines. He is a member of Fox Point Lutheran Church in Fox Point, Wis.